Affordable SUP Hand Pump for Inflatable SUP Paddle Boards. 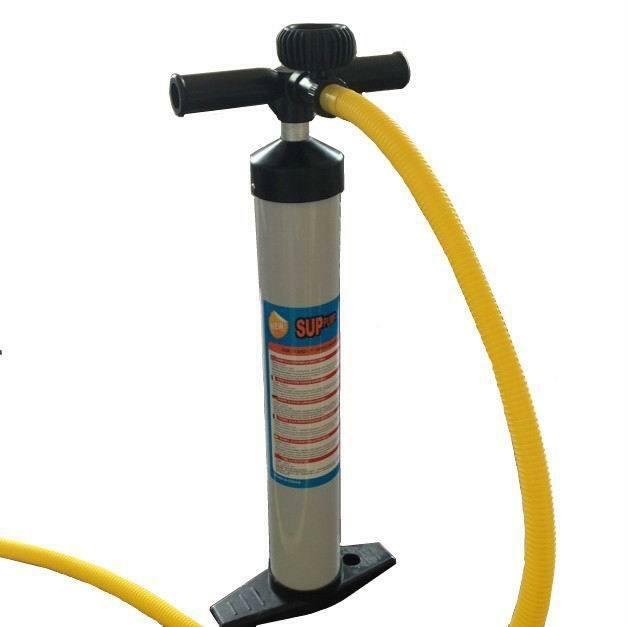 New hand pump specifically developed for the inflation of inflatable boats, SUP or any other high pressure drop-stitch inflatable chambers. Its special elongated shape and stoutness, along with an aluminum shaft allow this pump to inflate a SUP paddle board or air floors for boats, kayaks and KaBoats in 5-6 minutes with a minimum efforts. It has been developed for use on inflatable Stand Up Paddle Boards and other inflatable boats and dinghies which require a very high pressure (1 bar - 15 psi) to guarantee the right rigidity for use. This stirrup pump is tall and thin with a capacity of 2500cc and an aluminum shaft which allows it to inflate a SUP board very quickly. Quick Tips: When using hand pump to inflate paddle board do not use only hands when it become hard to add more air. Use body weight to push on handle of hand pump down. Use knees to raise up and then bend knees to let your weight to push on handle pump on its way down. Keep hands strait when pushing down. Relax your knees and let your weight and gravity to push handle down.